January is Cervical Cancer Awareness Month and this week on The Local Take on WCLK(Saturday 8am) I talk with Ian Fennell, Health Programs Manager for the Good Samaritan Health Center on Donald Lee Hollowell Parkway, about their program to help prevent Cervical Cancer. According to the Center for Disease Control and Prevention, cervical cancer is preventable and has declined over the last 40 years, yet nearly 13,000 women are diagnosed each year. The disease is still a challenge which disproportionality impacts women in the African-American and Latinx communities. All women are at risk for cervical cancer due to the human papillomavirus or HPV, and the connection to cervical cancer. Fennell explains that close to 86% of adults will be exposed to HPV if they are not vaccinated. The HPV vaccine Gardasil 9 helps protect against certain types of HPV that can lead to cancer or genital warts. It is typically given to people ages 9-26. Fennell explains the age that you should consider receiving the vaccine, and how Good Samaritan can assist parents with any questions or concerns about the vaccine for their children. 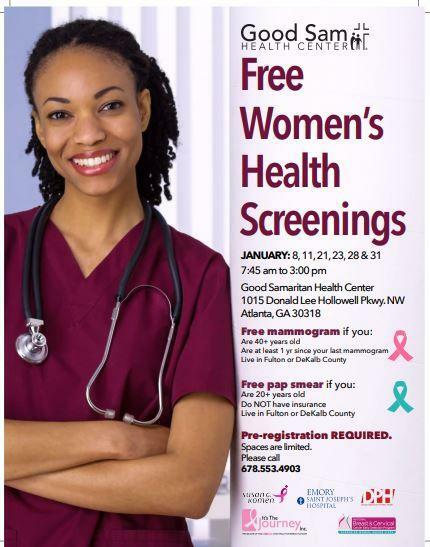 Good Samaritan is also offering free cervical cancer screenings for women in Fulton and DeKalb Counties. Kiplyn Primus talks about Cervical Cancer Awareness Month with Ian Fennell, Health Programs Manager for the Good Samaritan Health Center, on The Local Take On WCLK.